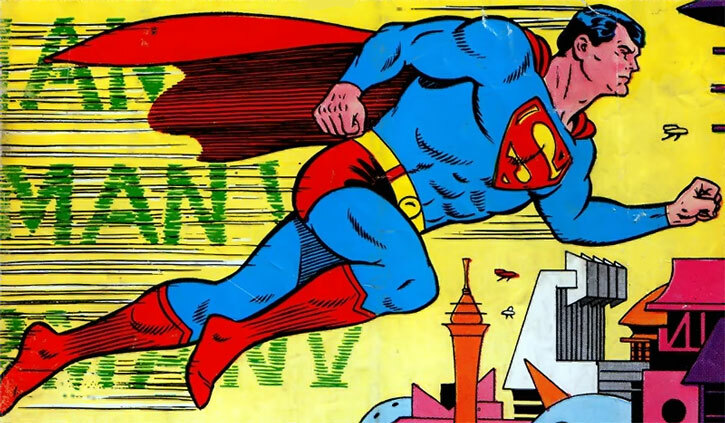 The Superman of 2465 appeared in a few DC Comics “imaginary stories” (aren’t they all ?) during the 1960s. As can be surmised, he was the Superman operating in a far future era, and a descendant of Clark Kent. His name was originally Superman of 2965, but this got retconned into a more reasonable Superman of 2465 in all later reprints. 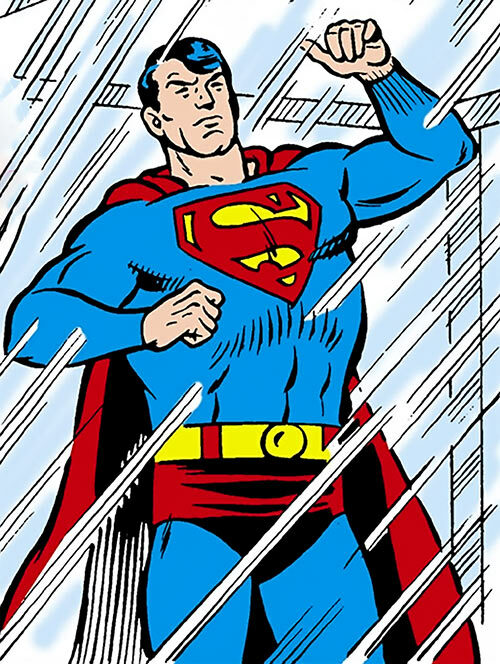 The Superman of 2465 was later re-imagined in the story “Superman 2999” in Superman v2 #135 and in Superman v2 #137. However this material has not been used for this profile, except for the connection with the future Batman. This story is also notable since it was written by Edmond Hamilton , an influential sci-fi novelist of the mid-XXth century. Beyond his work for DC Comics, Hamilton is best-known as the author of Captain Future. Real Name: Klar Ken T5477. Known Relatives: All members of the Superman Dynasty, including Superman I (Kal-El/Clark Kent), Superman II, Superman III, Superman IV (Dave Kent), Superman V, Superman VI, Superman VII (Kanton K-73) and Superman VIII etc..
Group Affiliation: None, informally a member of the Superman Dynasty. Base Of Operations: Worldwide mobile. Height: 6’2” Weight: 225 lbs. The future Superman works at the Daily Interplanetary News in his civilian identity. The editor is a computer named PW-5598, which has a personality akin to Perry White of the 20th century and which was designed by his descendent Per Wye T7357. Superman may receive a distress call at any time and anywhere. It will come through the holographic Ultra-Phone system which projects video image and sound anywhere. 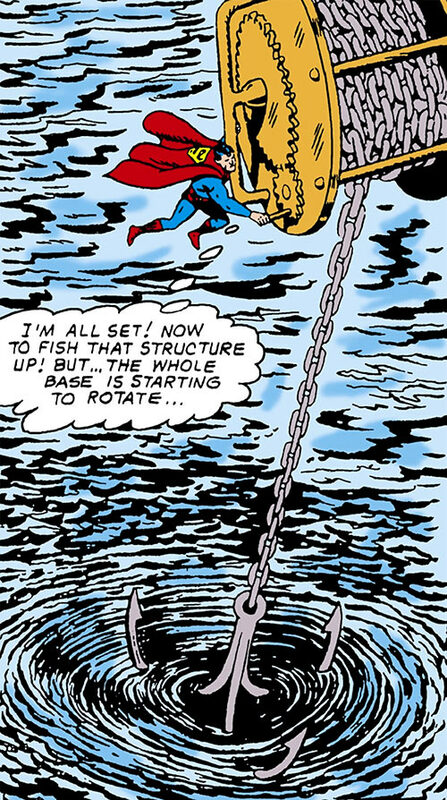 Since this doesn’t happen when he is in his secret identity, it would seem that the world is only generally aware of Superman’s location during his adventuring. The Ultra-News feed uses the same system and broadcasts news from anywhere live as they are happening. Justice is swift as an absolute and impartial verdict is rendered by a super-computer. The only punishment used is the so-called slowdown. The guilty are exposed to a ray which changes the body’s metabolism so that they can only move and live far slower than normal humans for the duration of the sentence. As they are released in this state the world around them appears to move at super-speed. Thus, the convicts are far too slow to perform any crimes and get away with it. Further, they are immediately identified for criminals undergoing a punishment by the rest of society. Unlike the original, the Superman of 2465 has no weaknesses to any type of Kryptonite. While this is good he does instead have a paralyzing vulnerability to a chemical residue present in all natural water bodies around the Earth (!). Thus, he is particularly vulnerable against common sea water and can never dive into the sea or a lake. The Joker once used a water gun to spray him with sea water, which was debilitating. All in all, this is a worse vulnerability than what Kryptonite ever was to the original Superman. Once, his archenemy Muto created sea water artificially on another planet, and from there simple water bombs. Those too did affect the Superman of 2465. This suggests that his weakness is just normal sea water – unless Muto knew the exact chemical found in Earth’s water and had created that too in his sea water. Very soon, Klar built a belt that would automatically carry him away from water whenever paralysis had set in. One may assume that this Superman also receives all of his powers from the yellow sun of the Earth. If so he would have in DC Heroes RPG terms a Loss Vulnerability (Red sun radiation) as well as a Solar Sustenance Power of at least 20 APs. But these have not been demonstrated. Neither has he shown to have any vulnerability towards magic, unlike the original. The Superman dynasty was expounded upon heavily in fan fiction and some of it is reiterated here since it’s good stuff. The invulnerable “Kryptonian gene” (sic) has spread throughout the many daughters and sons of Superman’s descendents. Ever since the time of the first Superman (Superman Prime a.k.a. Kal-El/Clark Kent) the role of Superman has been inherited usually by the first son to be born. Tradition dictates that there can only be one official Superman and one official Superboy, his future successor, to represent their heroic tradition. Sometimes a daughter could also train as Supergirl. Nothing else is stated about the role of Supergirl. There have been 20 Supermen before the current one. This relative present Superman XXI is one Klar Ken T5477, who was born in 2444. He is destined to serve as acting Superman between the years 2465 to 2499. He has an uncle named George Ken T3871. Klar married co-worker Lyra 3916 Lennox in 2475. They had three children: Adam, Alan and Lorelei. In 2499 Superman is set to give over the mantle to one of his two sons who both had been training as Superboy (read all about it with Darkmark – scroll down to Superman of 2499 !). The original Superman had arrived on Earth in his rocket in 1950 as a 3-year old child to be raised by the Kents. In 1955 he had become Superboy and during his college years he changed his name to Superman. He had married Lois Lane and they had children, as had his cousin Kara Zor-El aka Supergirl. Superman III had to pretend that his Kent identity had been killed. He then adopted a new identity as Jon Hudson (possibly starting another lineage with that name). Superman IV’s identity was revealed in a monorail accident. A later Superman had completely abandoned his secret identity in order to become a full-time crime fighter before his son took over the role. Superman VII had several children as did the daughter of Superman XIV and the uncle of the current Superman. There is also a lineage born from the union of a Superman and a Wonder Woman sometimes in the past. The current daughter of the lineage of Kara Zor-El is a blonde named Katherine de Ka’an. So all in all, there are a lot of Kryptonians around the world forced to hide their powers from the public and only use them between themselves or in secret. Some find this unagreeable and so some have taken on other costumed identities such as Powerman, Hyperman, Herculion, Ultrawoman and Guardian Girl. Others have even moved on to other worlds to start new lives and identities. According to the fan fic they all still have a vulnerability towards magic, but not Kryptonite. The entire El lineage – who all call themselves Kryptonians in contrast to the descendents of the Kandorians who are Rokynians (which should include the entire lineage of Kara Zor-El) – has a big family reunion once every year in Metropolis! The Superman of 2465 appears to have all or most of the original Superman’s powers. He has, for example, never demonstrated any hearing powers or his microscopic vision. He is still something of a rookie and isn’t as smart as the original although he is a technological genius and marvel. As was common for Silver Age Kryptonians and Daxamites, his telescopic vision is powerful enough that he can look at planets in nearby solar systems with some focusing. Likewise he can very quickly fly between planets. His greatest drawback is his vulnerability towards common sea water. It leaves him almost completely powerless and totally paralyzed while immersed in it. 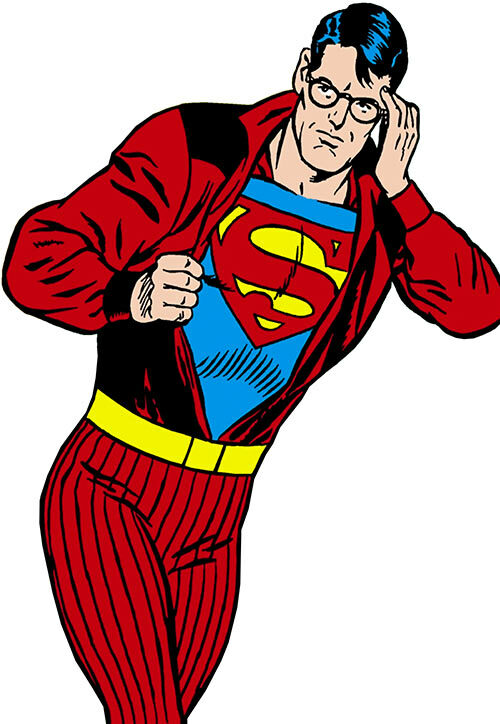 The Superman of 2465, Klar Ken T5477, is the direct descendent of Kal-El/Clark Kent, the first Superman. He is at least the ninth, or even the twentieth, man in line to carry on the legacy of the Man of Steel. His ancestor Superman IV got his secret identity uncovered as he had to stop a suburban jet-train from crashing before he had time to change into his heroic identity. It is known that his ancestor, Superman V, had an arch-foe named Vyldan. Superman VII’s secret identity was revealed as his superpowered baby son accidentally ripped open his shirt as they had visitors. However, these incidents apparently didn’t stop future descendents from keeping up with the tradition of having secret identities. There now exists a federation of planets (including at least the Earth, Mars, Pluto and, supposedly, Jupiter’s moons, Saturn’s moons and Uranus’ moons). It is led from the Hall of Worlds in a Capitol city. Superman was deputized to become a lawman of all the member planets at the start of his career. The Daily Planet has changed name to the Daily Interplanetary News (DIN). It regularly broadcasts on the Ultra-News network, a holographic system that requires no receiver or screen. Superman, as Klar, works as a reporter at the DIN. 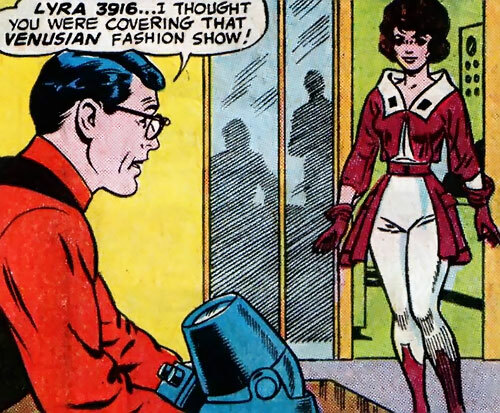 At work, Klar dates Lyra 3916 (his Lois Lane). This beautiful brunette that likes Klar but strongly dislikes Superman (the exact opposite of the sentiments of the original Superman’s Lois Lane). He also has a co-worker named Jay L-3388 (his Jimmy Olsen). Naturally, Superman also has his own gallery of rogues. One of these is Muto, a human mutant who uses his colossal intellect for crime and robbery. Muto is his Lex Luthor in the size of a yellow Mr. Mxyzptlk, one whose origin actually goes back to Superman’s father’s activities. In 2465 Muto tried to defeat Superman with Kryptonite, which failed since he wa simmune. In 2466 he returned with three alien lieutenants to menace Superman again using an arsenal of powerful weapons. But Muto again failed in the end as he was stopped and banished back to his home dimension. Superman again later in 2467 fought the Joker and Muto with the Batman. I conjecture that the chemical traces in all sea water that he is vulnerable against are rare radioactive elements, somewhat similar to Kryptonite. It was stated that the substance was created in a former nuclear war, possibly World War III. Thus this war may have produced the subsequent Post-Apocalyptic era of Kamandi – whose stories were told a few years later – sometimes in the late 21st century. 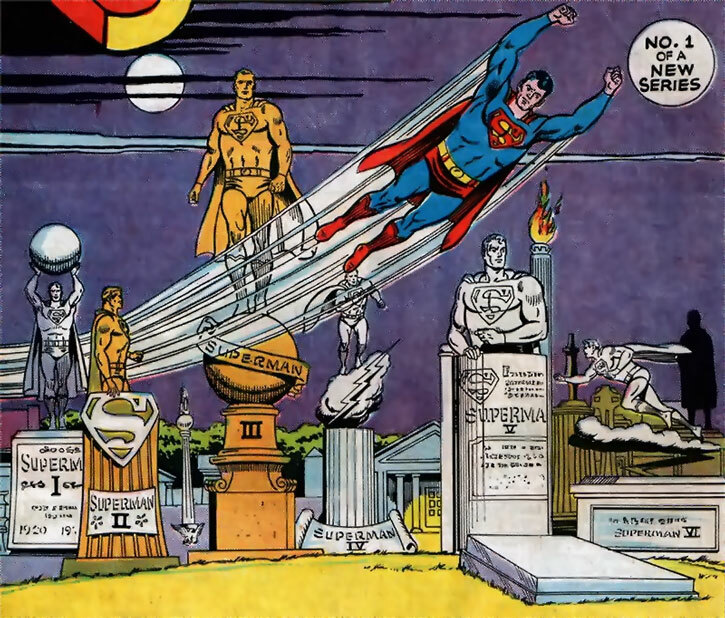 Future Superman’s time far precedes the time of the Legion of Super-Heroes since his native era was retconned. 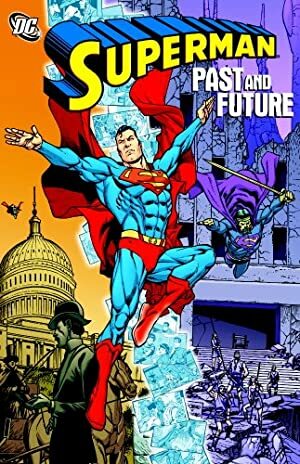 We also know that by the 30th century there has already been six world wars, and that at least in one continuity there is a descendent of Superman Prime in Laurel Kent. Thus I believe the Kamandi stories to precede these Superman stories only to later be followed by the Legion of Super-Heroes stories. Superman’s remaining adventures in these most interesting and rarely explored intermediary times between the modern and the Legion era remain to be documented! There is also some fan fic made of this version of Superman to be enjoyed! The future Superman of the year 2465 looks very much like his famous ancestor. He has black hair, a muscular physique and wearq the classical Superman costume. A noticeable difference is that he lacks the hair curl in the front that the original had. Instead, his hair lies thickly towards the left. In his secret identity he wears telescopic spectacles, typically worn by news reporters and which look like the classic eyeglasses worn by the original! As Klar he wears the typical clothing of his time, which has started to resemble those of Pre-Crisis Kryptonians. The Superman of 2465-2467 is a selfless, sacrificing and true hero. Without hesitation he will throw himself against any and all odds and dangers. He will only prepare backup plans if he has good reasons to do so. He appears proud of his ancestors and feels that he needs to carry on the Superman legacy, which is an honor to carry out. Kryptonite, towards which he is immune, is seen as nothing but a precious souvenir of the original Superman’s perished world. He adores his co-worker Lyra 3916, whom he currently dates, but they have not yet entered a serious relationship. Superman considers his arch-enemy Muto to be the most dangerous criminal in the galaxy. Area Knowledge (the Planetary Federation space), Expansive Headquarters (Space Citadel), Highly Advanced. The Daily Interplanetary News (Low), Bron Wayne E7705 aka the Batman of 2967 (Low). 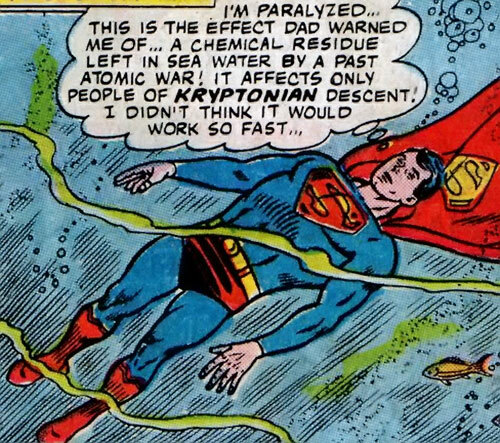 Loss and Paralysis Vulnerability (Sea water – a chemical residue left in all the world’s sea water by a past atomic war has an utterly debilitating and paralyzing effect on Superman, Range of Touch, Common), Secret Identity. ORIGINAL SUPERMAN COSTUME [BODY 25, Skin Armor 05, Note: All Supermen so far have used, as does the Superman of 2465, the indestructible Kryptonian costume of the original Superman]. SPACE CITADEL [BODY 20, STR 15, Invisibility 12, Lightning 16 (security systems only), Note: The citadel, usually kept invisible for security reasons in its orbit around the Earth, looks like a huge cut diamond. It has an air-lock at one of the nodes for entering it; directly inside the airlock, however, is a electric force field of immense strength to dissuade any unwanted visitor. Source of Character: Superman v1 #181 (1965) (reprinted in Superman v1 #244) & Action Comics #338, #339 (1968) & World’s Finest #166, stories by Edmond Hamilton. Helper(s): Christopher Cottingham, Darci (editing).